Canada, trip, Niagara Falls and home | Can I Bring the Dog? 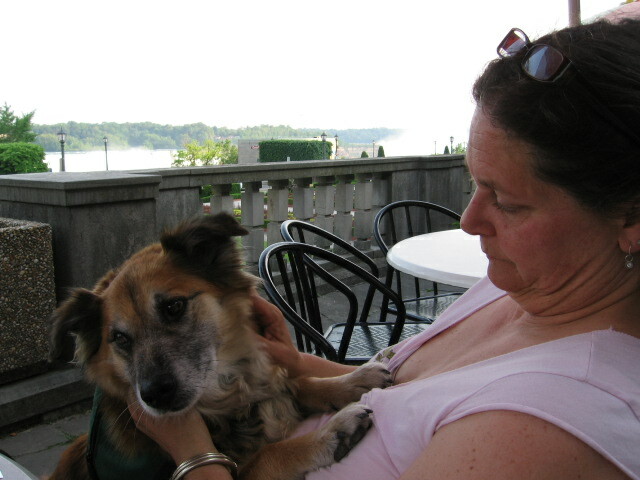 The last day in Toronto, we picked up Chico at the kennel. As usual, he turned himself inside out with joy that I had kept my word and come back for him*. They said he was great with the staff and great with the other dogs. I wonder what it takes to be not good with the other dogs because the first time he barked at something, I realized that he had pretty much barked non-stop for the last three days – he was so hoarse that you could hardly hear him. When we left town, it was hot and muggy, and it stayed that way all afternoon. Mila is a great map reader and she found small, scenic roads for us to take on our way to Niagara Falls. As we got within striking distance of the falls, we found signs for an arboretum and a butterfly garden, so we parked the car and went to have a look around. 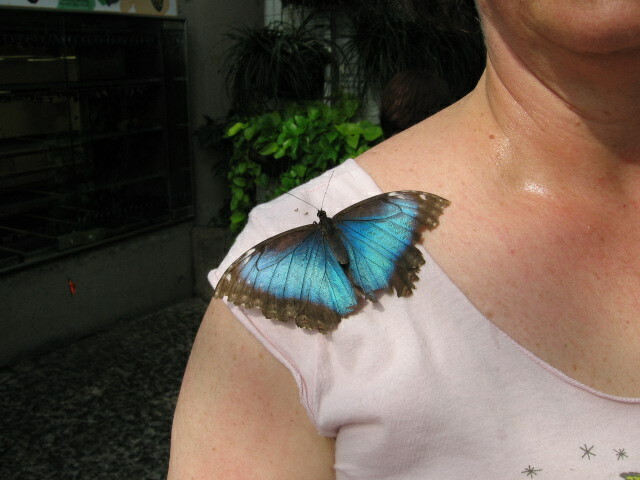 They say don’t touch the butterflies, I had to think that letting them touch me was OK.
We stayed in the relative cool of the butterfly house for an hour or so and then pushed on to the falls. The crowds were thinning and the pavement was cooling when we arrived, so we took a walk along the promenade overlooking the falls. Chico was fairly unimpressed. I think he was hot, the pavement was hot on his feet, and there were a lot of people that he wasn’t allowed to greet. We went to a nearby outdoor cafe and had a cool drink and a salad . . .
and headed for the bridge leading to the States. Our entry was easy. Mila, as a new arrival from Europe, had to go inside and get photographed and fingerprinted (oh, what a welcoming nation we are), but no one cared about the dog’s papers, food, or treats. Chief Navigator Mila found a road that ran along side the southern shore of Lake Ontario and we saw a beautiful sunset. We pushed on to Rochester, NY where we found a room at a Comfort Inn. The next day we hopped on the interstate for a few hours, heading for the cooler and greener hills of Vermont. 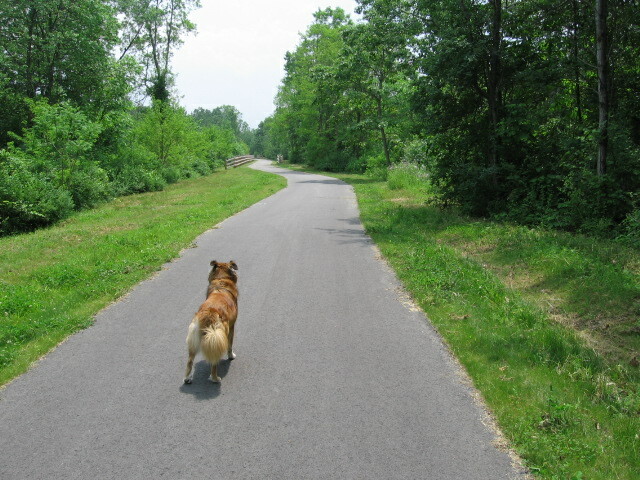 we found this bike path and took a walk. The cooler weather came in the form of a GIANT thunderstorm, so big that we pulled off the road for about twenty minutes and waited out the worst of it. Chico doesn’t love thunder, but he stayed steady and quiet in his crate. Once we took off again, we realized the car was moving faster than the storm and we were right back in it. By this time we were back on my home turf, right by Lebanon, NH, so I took us to the 7 Barrel Brewery for dinner. After ten days in Canada, we finally ordered, in New Hampshire, poutine. It was pretty good, though I can’t speak to its authenticity. Another couple hours in the car and we were back home. 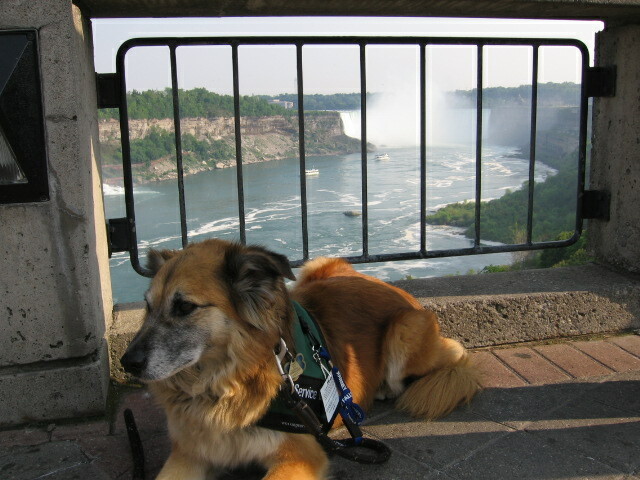 This entry was posted in Uncategorized and tagged Field Trip, niaigra falls, Ontario Canada, travel with dog. Bookmark the permalink.